The Operating Theatre Journal : What Happened after a Nottingham Surgeon Dined at Restaurant Sat Bains? What Happened after a Nottingham Surgeon Dined at Restaurant Sat Bains? It led to a four-year long medical study. One’s a Michelin-starred chef, the other a top surgeon - two Nottingham experts in very different fields. But when Queen's Medical Centre surgeon Charles Maxwell-Armstrong dined at Restaurant Sat Bains, it occurred to him that a high-pressured kitchen could have the same issues as an operating theatre, in terms of stress, time-critical and striving for the best possible outcome. Now, a number of years later, a new medical report reveals how behaviour in the kitchen of the two Michelin-starred restaurant, in Lenton Lane, could potentially be used in a hospital operating theatre. The report outlines processes observed such as the ‘stop moment’ - a call-out by staff to pause service and correct a problem - and real-time cameras tracking activity. Mr Maxwell-Armstrong, a co-rectal surgeon, contacted the chef after his dining experience and was invited to spend a busy Saturday evening observing chefs in action. 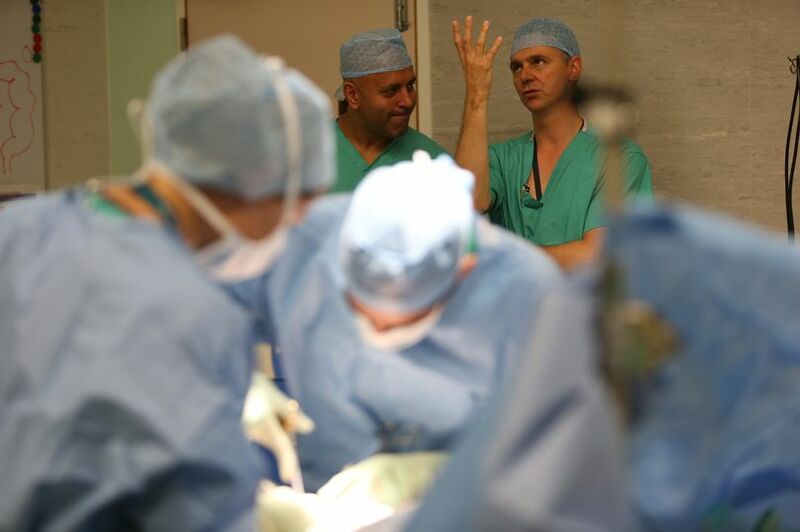 In return the surgeon invited Mr Bains to swap his chef whites for scrubs to witness an operation removing a cancerous tumour from a male patient. The ‘Food for thought: skills of a Michelin-starred restaurant potentially transferable to theatre’ report was completed with the help of PhD student Rebecca Noall, who observed the chefs for one service a week over four months. Operating theatre staff, including surgeons, anaesthetists and nurses, were then quizzed on the findings. The majority said the ‘stop moment’ was the most feasible for implementation and had the greatest potential for improvement in patient safety - something, coincidentally, that was beginning to happen in operating theatres around the same time of the study. Mr Maxwell-Armstrong said the swap had proved worthwhile, adding: "You tend to work in your own little bubble. Once you get out of the box completely into a different area you will learn from it. “Sat thought he was simply cooking a plate of food while I was doing life-saving surgery. But I disagree. We are both trying to achieve the highest standard possible in our field so the actual pressure is the same. “I was incredibly impressed with the awareness Sat had of everything that was going on around him. “When you are cooking a ten-course meal for 15 people to such a high standard you really have to rely on your team members. The exchange wasn’t a one-way process. Witnessing the medical staff briefing after surgery, Mr Bains has introduced a post-service briefing. “I learnt a lot form that visit. The similarities are there although I’d never thought it before," said the chef.